Mr. Walker's Blog: How to Bring Celebrities into Your Classroom for Reading Instruction? How to Bring Celebrities into Your Classroom for Reading Instruction? Storyline (www.storyline.com) is a website published by the Screen Actors Guild. 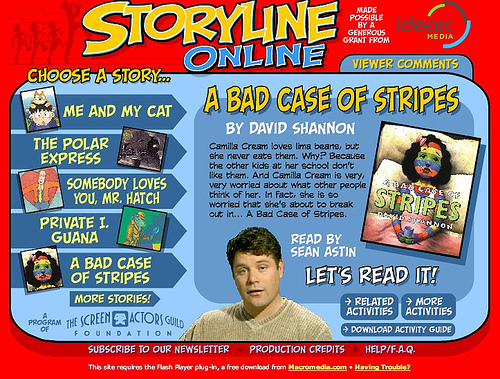 The site features videos of famous actors and actresses reading children’s books. There is an index of books to select from. The videos display well on an interactive white board. They can also be used in a listening center. With most stories there are activity guides and extension activities. Storyline may be used during whole group instruction as part of interactive read aloud. It may also be used in centers. Storyline may be used to model inflection, fluency, and to engage students in the process of reading. They are able to apply the strategies that we teach them while having fun listening. You can pause, stop and rewind. You can also display captions in order to discuss word use throughout. Storyline is fun and interactive resource that is a great tool for any balanced literacy initiative. There a re a number of uses in an elementary classroom. I would love to hear how you use this with students. Please leave a comment below to share how you use Storlyline Online with your students. Create Your Own STEM Textbook for Free!